Zimbabwe’s embattled leader Robert Mugabe has vowed to stay in power for several weeks, despite intense pressure on him to stand down now. The Zanu-PF earlier sacked him as party leader, and gave him less than 24 hours to resign as president or be impeached. At the same party meeting, Mr Mugabe’s 52-year-old wife, Grace, was expelled from the party, alongside a number of other senior officials. But in his speech later in the day, Mr Mugabe made no direct mention of those developments. “The (ruling Zanu-PF) party congress is due in a few weeks and I will preside over its processes,” he told the nation, flanked by senior military generals at his official residence in Harare. He acknowledged criticism against him from Zanu-PF, the military and public, and stressed the need to return Zimbabwe to normalcy. 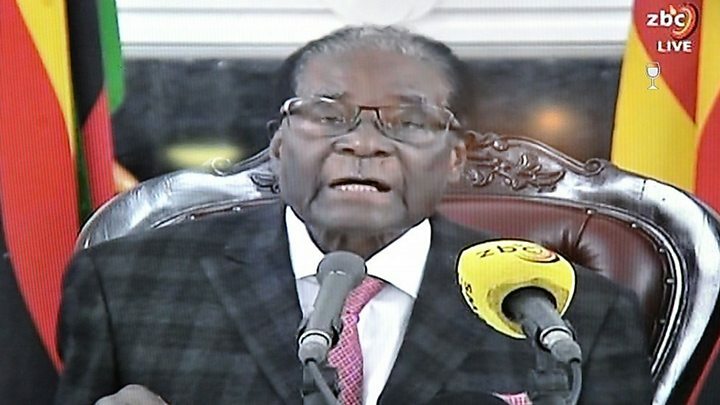 “Whatever the pros and cons of how they (the army) went about their operation, I, as commander-in-chief, do acknowledge their concerns,” he said, in reference to the army’s move last week to take over the state broadcaster. Neither did he mention any possibility of resigning. Tens of thousands had joined huge demonstrations on Saturday, with many believing he was about to step down. Zanu-PF has given Mr Mugabe until midday local time (10:00 GMT) on Monday to resign or else face impeachment proceedings.